It is replaced by the Star TSP650ii. The Star TSP651 boasts valuable features like a tear bar, low cost and high performance combined with the ability to work effectively in any environment. Out of the box, the TSP651 can easily be configured in Star Line or ESC/POS emulation mode and features a wide variety of interface options including USB and Ethernet due to its plug-in modules. New vertical mount stand and splash proof cover options help make it one of the most reliable POS printers in the world. 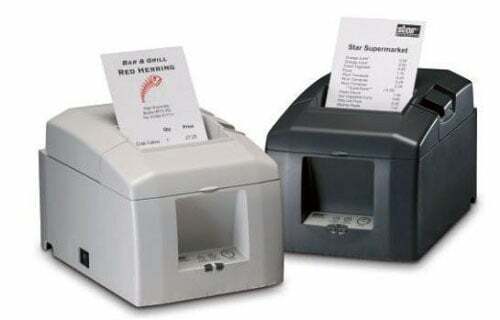 Thermal printing, Tear bar, USB interface, Two Color. Power supply (Part# 30781753) and cables sold separately. Color: Dark gray. Thermal printing, Tear bar, Serial interface, Two Color. Power supply (Part# 30781753) and cables sold separately. Color: Dark gray. Thermal printing, Tear bar, Serial interface, Two Color. Power supply (Part# 30781753) and cables sold separately. Color: White. Thermal printing, Tear bar, Parallel interface, Two Color. Power supply (Part# 30781753) and cables sold separately. Color: Dark gray. Thermal printing, Tear bar, Parallel interface, Two Color. Power supply (Part# 30781753) and cables sold separately. Color: White. Thermal printing, Tear bar, USB interface, Two Color. Power supply (Part# 30781753) and cables sold separately. Color: White. Thermal printing, Tear bar, Ethernet interface, Two Color. Power supply (Part# 30781753) and cables sold separately. Color: Dark gray. Thermal printing, Tear bar, Ethernet interface, Two Color. Power supply (Part# 30781753) and cables sold separately. Color: White. The whole process of replacing my old receipt printer was very simple and quick - shop online, call customer service with questions, and order the printer. It arrived in two days, was easily installed, and we were printing receipts right away.